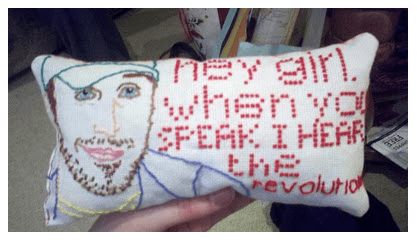 Hey girl, I love this needlepoint pillow you embroidered for me. heeheeeee. Quick Keiran has an Etsy shop and is taking special orders. Our Turn: Feminism for Newbies: THIS. IS. THE. BEST.. This isn;t needlepoint. It’s embroidery on fabric. oops! you are so right. thanks for pointing it out!